Very cool glasses – it’s fun to step out of one’s comfort zone. Well done Madame. Thanks Beth…every little bit helps! What a compliment!!! My sincere sympathy on the death of your husband. It was not that long ago that he was part of some of your stories. Love the dame glasses! Excellent observation on your granddaughter’s part too! She is bang on with that one! Here’s to all of us channelling our inner Dame on a regular basis! Amen to that! Thanks Blanche! It sure isn’t Rosy! Thanks for reading. Love your dame glasses too! We green eyed gals should all wear cat’s eye glasses. I agree with your granddaughter! Now I know where Gadoosh came from…just sayin. I always look forward to reading your blogs. Thanks Janice…yes, Gadoosh has purple hair as well. I guess I’ve always had a lot of purple lurking in my interior nether regions. 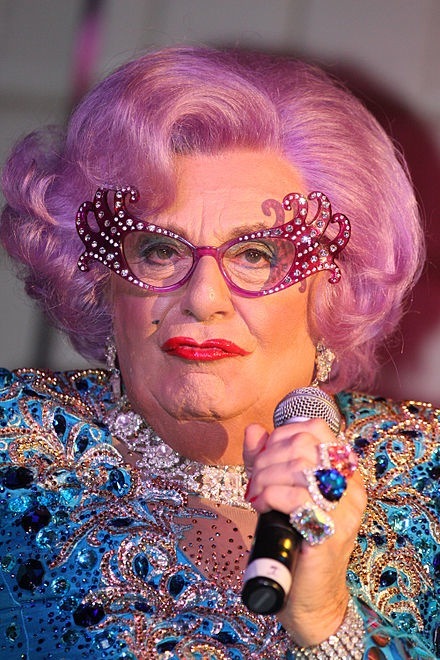 So who would have thought that your true inspiration was Dame Edna, and you didn’t even know it! All due to your granddaughters observations! . Your new glasses seem perfect to compliment your creativeness and fun personality! Very spect-tacular!!!!!!!! From the mouth of tweens! Thanks Britt Girl…glad you like the glasses. I have turquoise Harry Potter-round glasses. (See my picture) I love when young people who normally wouldn’t notice me see my glasses and say, “Oh wow! Cool glasses.” I figure it gives them hope for having a little coolness in old age. The kid nailed it!! Best comparison ever. Cheeky monkey! 😊 I knew you’d like that one! This is all just so fabulous in so many ways! !